As technology becomes obsolete, and organizations grow, merge or consolidate operations, a number of enterprise applications end up outliving their usefulness and quickly become “legacy applications”. As organizations move on to modern applications, the non-critical legacy applications continue to lockup valuable infrastructure resources and software licenses. Additionally, at a time when organizations are looking to invest in new cutting edge technologies to improve their operations and customer focus, legacy applications end up consuming considerable new IT budgets, in the form of maintenance, support and personnel costs, which otherwise could have been utilized for technology modernization. While these legacy applications provide minimal business value, backing up the applications to an offline storage is not an option as organizations need to retain active access to the retired data either for regulatory, legal or business requirements. 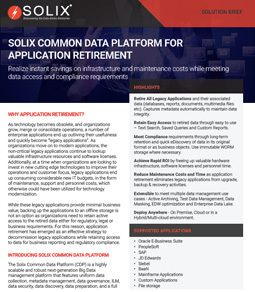 For this reason, application retirement has emerged as an effective strategy to decommission legacy applications while retaining access to data for business reporting and regulatory compliance.